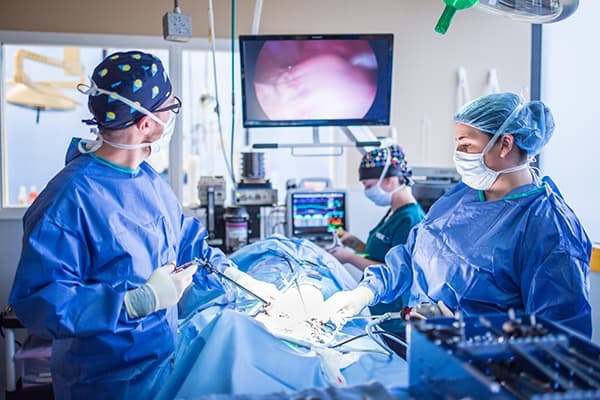 Veterinary Specialty Center of Seattle’s team of surgeons perform abdominal surgery, soft tissue surgery, spaying and neutering, and more. We understand that your dogs and cats are your family. Our compassionate and caring staff will do everything we can to comfort you and your pet. Our goal is to make pet surgery as least invasive as possible. Don’t feed your pet anything the night before surgery (usually not after 8pm). Please let us know beforehand if your pet is on medication and how often they take it. Before surgery, be sure to walk your dog in the morning so that they can eliminate. Know that before the surgery, we may give your pet an anti-inflammatory or pain relief injection, administer a fentanyl patch, or perform an epidural and nerve block. After the procedure, the doctor may prescribe medication for your pet to take home with you. If your pet is being spayed or neutered, keep in mind that these procedures involve general anesthesia and a possible stay for your pet. After your pet is home, their activity must be restricted so that they can heal properly. For additional questions about pet surgery and protocol, please call us at 425-697-6106. Our team is happy to answer your questions.